Author Bess Streeter Aldrich was born in a house on this site on February 17, 1881. The house she was born in was later demolished, and the house that is currently on this site was its replacement. Aldrich wrote 13 novels and 160 short stories during her distinguished career. Her best-known books include Song of Years, The Lieutenant's Lady, Miss Bishop, and A Lantern in Her Hand. She attended school in Cedar Falls and graduated from the Iowa State Normal School in 1901. She taught in Boone, Marshalltown and Salt Lake City before returning to Cedar Falls. She was assistant to the superintendent in the Normal School's primary training school. She was married to Charles Aldrich in 1907 in the house that stood on this site. They lived in Tipton for two years before settling in Elmwood, Nebraska. Her first novel was published in 1924, and she became a regular contributor to the Ladies Home Journal and other magazines. Several of her books were bestsellers. Most of them were also translated into other languages and one was made into a film, Cheers for Miss Bishop. Aldrich died in 1954. The house that stands on this site is a private residence. The "Bess Streeter Aldrich Bookshelf" at the Cedar Falls Historical Society Museum, 303 Clay Street, is preserved by the local chapter of the Daughters of the American Revolution as a tribute to one of Cedar Falls' and Iowa's best known authors. 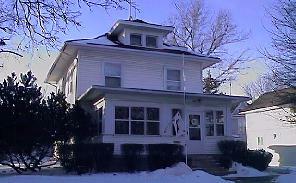 In addition, you can visit the Bess Streeter Aldrich House and Museum in Elmwood, Nebraska, at http://lincolnne.com/nonprofit/bsaf/.